With all their current momentum, amiibo figurines were bound to make an appearance during the latest Nintendo Direct - and so they did. The first inclusion of amiibo figures in the Direct was the announcement of Wave 3 figures of the Super Smash Bros. series becoming available in February, which we're all already aware of. However, we then learned information about the next wave in this range. Wave 4 will contain Robin, Lucina, Pac-Man, Wario, Ness, and Charizard - all being available in from April 24th. If that didn't tickle your taste buds enough, then maybe the next piece of news that the Direct revealed will. A whole new range of amiibo figures will become available on 20th March - the Super Mario amiibo series (of course) - alongside the release of Mario Party 10. 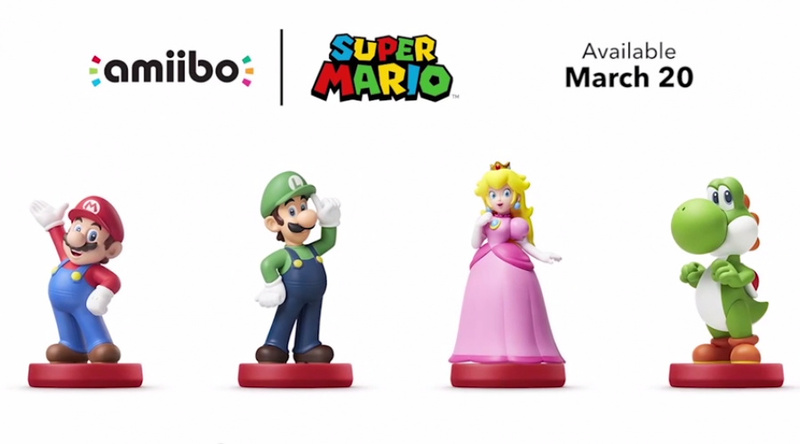 This new lineup of figures includes Mario, Luigi, Peach, Yoshi, Bowser, and Toad. These figures will unlock a new mode when playing Mario Party 10 - amiibo Party. Check out our article on that topic for more details. 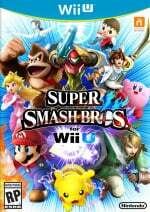 It's worth noting that although Donkey Kong, Rosalina, and Wario have not received amiibo figures from the Super Mario series, their Super Smash Bros. amiibo will work within the game - the same being said for Mario, Luigi, Peach, Yoshi, and Bowser (great for those concerned with the current Super Smash Bros. amiibo series' versatility). This is also the case vice-versa, meaning amiibo from the Super Mario series can be used when playing Super Smash Bros. for Wii U and Nintendo 3DS. However, data from amiibo within the Super Smash Bros. range must be erased before using the figures with Mario Party 10, and this applies both ways; this is due to each toy only supporting one set of read-write data. Logically, Captain Toad: Treasure Tracker will be another game to receive amiibo functionality, with the new Toad amiibo activating a sort of hide-and-seek game where the player must find 'Pixel Toad' in each level. 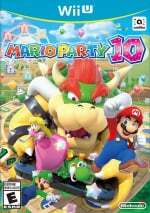 An update to the game will become available for download on 20th March to activate this feature - the same date as the release of Mario Party 10 and the new Super Mario amiibo series. Finally, the aforementioned amiibo support for Super Smash Bros. for Nintendo 3DS will be arriving in a February update, making that the first 3DS game in the West to support the toys, while upcoming release Ace Combat Assault Horizon Legacy + will also use some figures. The New Nintendo 3DS has an NFC scanner built into the touch screen, while an accessory for older models will come later in the year. With Nintendo's latest step in the world of amiibo, it's clear that more and more franchise ranges will become available; it wouldn't be a surprise if a Zelda or Pokemon amiibo series is released later this year. Are you excited by this for collection purposes, or find it annoying that you may have to purchase certain amiibo for certain functionality? Let us know. I'll go preorder Ness and Toad after school today. Guess we know that the Mario one was real. Well at least we know why no more Wii Fit Trainer, Villager and Little Mac, they are busy producing more Mario and Peach with a different base. And we get a normal Toad but no Captain Toad for the Captain Toad game? I'm beginning to think describing Ntinedo's implementation of amiibo as "winging it" would be overly generous. I did like the pained expression on Bill Trinens face when he said we would have to wipe our SSB data to use the amiibo in Mario Party 10, like even he coudln't believe he was saying it. Half expected him to say "please understand". And why is it taking so long to get out NFC portals for the old 3DS models. It's a piece of plastic w/ an NFC reader and IR port. Should have come out alongside the new 3DS,, it's another slap in the face. We will probably get Charizard though, my kids have a thing for Pokemon collectibles, amiibo or not. Were amiibo shown in the Splatoon hub world or is that game spared? Only two amiibos I care about this round are Pac-Man and Ness. keep bringing em! i'm kinda glad theres only 6 coming for MP10 though. I'll be out of display room and money by then! Well, it's a safe bet Ness will quickly become a $40 acquisition for those that don't pre-order. fianlly toad! but i have no wiiU or new 3DS, just the old one. can't use it then, nintendo!! Finally! Thank goodness at least some confirmation on the adapter for the original 3DS! THANK YOU FOR CLARIFIYING THAT!!! +6ch6ris6 I feel the same way! I would so rofl if the amiibo that would be "discontinued" is the SSB Mario characters that is being re-release in Mario party form. The Marth amiibo news already made me smug enough. Would be more smug if I sold mines on ebay for those crazy prices. I'm really disappointed that Nintendo is (probably purposely) not having more amiibos available than they should of their current waves. Instead, Nintendo is trying to brush them under the rug while bringing out the new ones which will probably have the same problems. I'm interested in the Toad amiibo, but I'm losing interest in everything else amiibo related pretty fast. I just hope they don't give the new amiibo's specific functionality that the old ones don't have. If they do, I am done collecting them. How many different Mario amiibo's am I going to have to buy Nintendo?! Tell me now so I can put the money aside. I can bet you anything that the Mario lineup wont be as impossible to find as the Smash ones. But I wonder if the prices will be any different? @Tiredman IIRC, I think they said that whether you have the Smash version or the Mario Bros. version, they both work exactly the same. But say you use your Smash Bros. Mario amiibo and it has that Figure Player data on it, you'll have to delete it in order to use the Mario Party 10 amiibo functions. I'm buying luigi but i wont be using the others in smash so they can work for other games. I am SO relieved that the different series has the same functionality across games for the same figures. But man, imagine the mess of pokemon amiibo. 721 figures + forms, gotta catch 'em all. Going to have to get an amiibo now as I want to play the amiibo party in Mario Party 10. 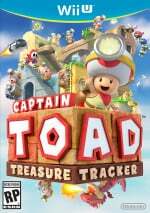 I could get the Toad amiibo as I have Treasure Tracker but the add on for that is so lame in my opinion. I could get DK or Rosalina if possible but as long as I get a MP10 compatible one, I'll be ok. I prefer these designs. I will end up with 2 Peaches and 2 Bowsers. From wave 4 I want Pac and Wario. Pac-Man and Ness are probably going to be the most bought out amiibos. former because of 3rd party contracts (really, there might be production limits) and latter because of the energized fanbase due to Smash. it'll be followed by Charizard (western Pokemon fans), then Lucina. Yoshi is doing some kind of Beyonce move?? Will try and pre-order Pac-Man & Charizard when I can. Are theses up for pre-order anywhere in Europe yet? Wait wait WHAT? I won't use amiibo's with Mario Party (wasn't going to buy it anyways now that I think about it, oh well). @Captain_Gonru - More Marths b/c he is in the new game, but the others people wanted like Villager, Wii Fit Trainer and Little Mac and whoever else is hard to find (I'm only half heartedly following it)? But I'll give them credit, they did mention it, you're right. I don't know about amiibo plaza anymore. Been a really long morning. I was so excited coming in w/ low expectations, just wanted Mario Maker, Yoshi's Wooly World and Splatoon release dates and more info. 2 of those weren't even mentioned. And Kirby got delayed a week. And XCX had probably the longest trailer but no inkling of a date. It was a non-stop game filled ND, but it left me w/ more questions than answers. I hope they unlock mii suits in mk8 too. My kid can keep his mario luigi smash amiibos. Plus I won't need to buy Yoshi and Peach Smash amiibos. @Luffymcduck - It's at the 14:24 mark of the US ND if you are asking about erasing amiibo data, which your exasperation lead me to believe. @Captain_Gonru - Oh man, you started out so good, and then I felt like I was reading one of my own disgruntled posts, Thats not so good. Glad about Marth but I hope the other 2 rare ones are re-released as well. I was gonna buy a Smash Bros Luigi amiibo, but this new one looks way better. I'm mixed on this. I like that the same characters in different styles will be interchangeable. I don't like that we are getting a new line while the current one is still rolling out... but I do think that the new line of Mario amiibos should let you switch characters in the middle of Super Mario 3D World stages. I don't think Nintendo is "winging it". Look at the new Pokemon puzzle game that is free to play like a mobile game. Nintendo is systematically and purposefully throwing everything at the wall to see what sticks. We are the wall. Whatever is happening, it's future is completely unknown. We use our Amiibos for Hyrule Warriors the most. But I admire them every time. Zelda and Samus are the best, but I was even commenting on Pikachu's adorable little intricate feet yesterday. An easier way to collect favorite Mario characters, though different poses? Nice. I have a love/hate relationship with amiibo. The ones I have, I love. But rounding them up was harder than it should be for a line so young. Head over to an amiibo community group sometime. People are trading away collectibles they have been accumulating for years in exchange for rare amiibo that hit their country in tiny numbers. My Toys R Us is drowning in Mario, Peach, Yoshi, etc. But when the salesman says, "They sent us one Pit. That's all we've had." something is wrong with distribution on Nintendo's end. It's no wonder retailers are having to cancel US pre-orders, effectively making the hunt for amiibo an almost exclusive eBay activity. I'm all for Nintendo releasing as many different figures as possible, they're extremely collectible. But they must make them all available, not just on launch day if you're there the first few minutes a store is opened. Long rant short, bring 'em on. But make them available for all who want them. "find it annoying that you may have to purchase certain amiibo for certain functionality"
False advertising galore. So basically buying these things was a waste of money because I have to buy more versions of the same characters. Anyone else feel robbed? The picture next to these things shows they are compatible with 5 games, which now isn't true. Would prefer a captain toad amiibo. Might try modding one. As I stated already, I'm done with Amiibos. I really like how they look. Most are very detailed versions of iconic Nintendo Characters....what's not to like? What makes me done is the fact that the only way to get some of them is to overpay for them somewhere like ebay. @electrolite77 You don't "have" to purchase anything. The Amiibo stuff is just extras for people who bought them. My MK8 and Smash still work just fine without Amiibo's. Would there be a way to save amiibo data to the system so it can be used in another game but the data could be added back on later? If not then there should be. It'd be stupid to force people to delete their saves all the time just to use it in another game. "Nintendo is systematically and purposefully throwing everything at the wall to see what sticks. We are the wall. " Well if they were throwing everything at the wall at least SOMETHING would make sense, but it's all just nonsense - shortages, erasing data, new models, find the Toad?, get a rupee. Where's the Skylanders or Disney Infinity game, both proven winners? Or an Animal Crossing like Wara Wara Plaza? Or an app to keep track of which ones I own, or a website? 2015 things don't even come with an online code. Do they even show up on Club Nintnedo when we register them? OK, Mario Party 10 finally has a boardgame dedicated to amiibo, I'll give them that, but it's for NEW amiibo. Yes I know the old ones work, but how many confused parents will be guessing? Your'e a seasoned DI veteran, you know how confusing this stuff can be (b/c I've come seeking your help often enough). Why make it more so by introducing new amibo now as you said? That Ness amiibo is going to sell out really fast, I can see it now. Lucina is probably the one and only Amiibo I will be buying. Assuming it will work with the new Fire Emblem game. I don't know enough about that Code Name: S.T.E.A.M. game or if you can play the entire game as Lucina to know what the Lucina Amiibo even does in that game. If you have to actually use the Amiibo each and every single time you want to use Lucina in the game that will be utter trash. I wonder why the bases are red ? they looks like a budget version and not as detailed as the original . The Codename STEAM amiibo support means I'm now preordering Ike, Robin and Lucina (the latter 2 aren't available to preorder yet). Although I'm not sure I'll like the game (need a demo), I don't want to find out that all FE amiibo are rare if I do. Hoping they'll make a female Robin amiibo. @Captain_Gonru I agree with you on the mess and cleaning it up and if you mean every Amiibo would get a yarn version to see in game your wooly world idea is awesome. @rjejr Amiibo just isn't confusing to me. We bought a few we like and we try em out with games on a case by case basis. Cool. There is little to no practical reason to collect them all and I'm fine with that. The problem is that I think people have bigger expectations for them. In light of that maybe it is good they are releasing the second lineup of them already. I'll definitely pick up a Pac-man one. @aaronsullivan - "There is little to no practical reason to collect them all and I'm fine with that." "The problem is that I think people have bigger expectations for them." I do think that is a part of the confusion though. OK, confusion is the wrong word, so is misunderstanding. Clarity maybe? How do you explain - amiibo in SSB fight by your side, in MK8 they give you customes, in Captain Toad you can find a pixel Toad, in Hyrule Warriors you can get a rupee. and in Mario Party you can play as them, but only on the amiibo board, and all of this ONLY applies to some amiibo, not others, depending on the game. And someday they'll work on the new 3DS XL, and some day after that the original 3DS and 2DS models after Nintnedo releases a portal. I don't want to keep having to explain that to people over and over again. It isn't confusing, it's too long winded, even for me. @rjejr How about this? If you have a favorite amiibo character it will probably do something cool in a game with that character going forward. If you have a favorite game you may want to look into what amiibos could add extra fun to it. @rjejr Just to add to the confusion,you're also forgetting to add that you will need to delete your Smash amiibo data if you want to use them on the amiibo board in MP10 and vice versa as it is a 'read' game and each amiibo can only store 1 'read' game but other titles are only 'write' games so you wont need to delete your data with them.Not confusing in the slightest. Smash Bros. Mario amiibo: "I'm gonna mop the floor with ya! Come get some!" Super Mario Series Mario amiibo: "Hi, everybody! Nice to seeya! " Think its pretty rubbish that you have to wipe amiibo data to use them again - imagine a situation where you have five or six games with amiibo functions and have to wipe your amiibo every time you switch games. On another note - where's the Waluigi amiibo?! I prefer the new Peach over the Smash one. The dress looks more like Peach's dress. Wiping amiibo data when playing Mario Party 10 is a shame but it's a good thing I don't even have a Mario amiibo yet!